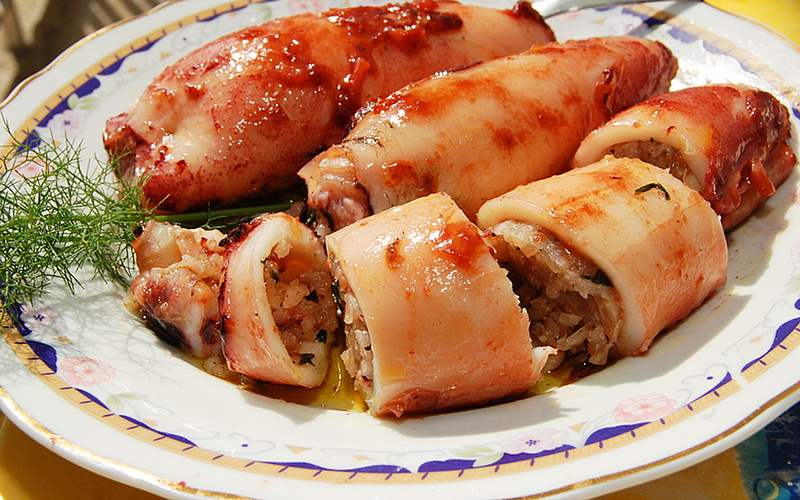 Fresh calamari stuffed with rice and herbs for a taste of the sea. Finely chop the calamari tentacles, leaving the bodies whole. Grate the onions and sauteé in a deep pan in olive oil until soft, adding the calamari tentacles and the rice. Simmer until the rice is parboiled, add the herbs, salt and pepper to taste, and remove from heat. Stuff the bodies of the calamari with the mixture, making sure they’re not too full so they don’t burst when the rice expands. Seal the open end with a toothpick. Place gently in a saucepan with the olive oil, enough water (preferably hot) to cover, and braise over medium heat for 1½ hours until the flesh is pink and tender. Serve hot.